How To Make The Perfect Ponytail With Pony-O! What is more frustrating than when your hair is all over the place and you're trying to focus on an important task like drinking that first cup of coffee, or you're running late for work? Whether you're a student, a career woman or an athlete, you've probably experienced this very thing more than once, if not daily! The ponytail is often the go-to hairstyle that can always be counted on to save the day! It is easily the perfect quick fix for our hair. Crazy or unruly morning hair? Tangled curls? Two or maybe three-day old hair? Throw it in a ponytail and off you go! But how awesome would it be if, in that rare moment when your ponytail is perfect, that it would stay in AND feel good AND not rip your hair out? Don’t we all agree that having the perfect ponytail is only a dream? Popular belief is that perfection doesn’t exist, but thanks to Pony-O, the perfect ponytail doesn't have to be a dream! With this revolutionary hair accessory, you can now have the perfect looking ponytail, whatever your hair type is. Throw away all of the complicated hair tools and accessories that you've used your whole life, because we will teach you how to do the perfect ponytail with one, easy-to-use hair accessory: the Pony-O. Does your ponytail look thin and flat? Do you backcomb your hair to lift your roots and get more volume? How about blow-drying your hair upside down? Do you stack up your ponytails to make it look fuller? If you answered yes to most of the questions, you definitely know the struggle of having a pencil-thin ponytail using elastics. 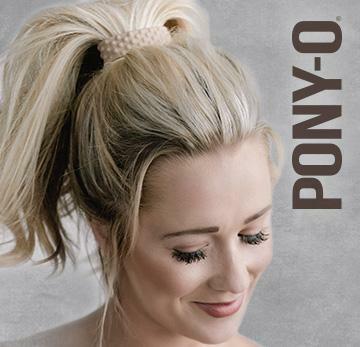 Pony-O's unique design will make your fine ponytail look thicker. It holds your hair up all the day so you don’t have to worry about drooping ponytails, and no broken hair! You know what the best part is? The perfect ponytail with Pony-O can be done in under a minute! No more waking up early to struggle making a decent looking ponytail! Here’s a list of thick hair problems. Any of these sound familiar? Hair tie snapping out of nowhere. Can't get that last wrap of the elastics around your thick ponytail. Headaches due to the weight of your hair. See our blog about ponytail headaches here. Styling it takes a lifetime. Although girls with thick and curly hair are blessed in ways fine hair girls only dreams of, it comes with problems of it's own. Let’s talk about hair ties breaking: there’s nothing more annoying than that! Feed your hair through the Pony-O ONE TIME, and shape it. No more feeding your hair back and forth through an elastic. Having thick hair can make your ponytail sag because of the weight of your hair. Pony-O provides maximum comfort and hold, making your hair feel weightless. It holds thick and heavy hair in place all day long, so you don't have to worry about loose and saggy ponytails! Getting the perfect ponytail is easy with Pony-O! Three steps is all it takes! Step 1: Using only your thumb and forefinger, pull your hair through the Pony-O, making sure to keep it close to your head. Step 2: Flatten and squeeze the Pony-O to hold your hair in place. Step 3: Using your thumbs, bend the ends of the Pony-O, separately, to secure your ponytail. DO NOT bend the Pony-O once in the middle. For a tighter hold, bend the ends more. Click here to watch a short video showing how you can easily do perfect ponytails with Pony-O. Pony-O gives you the perfect ponytail, but it also offers a lot of other easy yet beautiful hairstyles. Click here to see some hairstyle video tutorials that you can recreate using the Pony-O. When the perfect ponytail is not enough. If there’s such a thing as taking perfect ponytail to the next level, this might be it. If you are the type who likes to add embellishments to your hairstyles, you can make your ponytails pop by wearing our Designer Pony-O, or by dressing up your hair-blending Pony-O with the Bling Ringz. Designer Pony-O beautiful printed designs to make your ponytail eye-catching. Bling Ringz is the ultimate show stopper! It has a magnetic clasp, which makes it easy to apply over your Pony-O. It instantly gives your ponytail an elegant and dazzling vibe! It is so gorgeous, you can even rock it as a bracelet. Unlike traditional and cheap hair ties that snap easily and damage your hair, Pony-O is designed to last longer than elastics, and are comfortable and crease-free in all types of hair. You can wear the Pony-O in whatever hair length you have: short (chin-length), medium or long hair. Straight, wavy or curly hair? Thick or fine hair? Pony-O holds it all. Pony-O is waterproof and sweatproof so whatever your lifestyle is, go out there with confidence knowing that you can seize the day with style, security and comfort that every girl dreams of by using the Pony-O! Are you ready for THE perfect ponytail? Get yours here!